René Laloux's mesmerising psychedelic sci-fi animated feature won the Grand Prix at the 1973 Cannes Film Festival and is a landmark of European animation. Based on Stefan Wul's novel Oms en série, Laloux's breathtaking vision was released in France as La planète sauvage; in the USA as Fantastic Planet; and immediately drew comparisons to Swift's Gulliver's Travels and Planet of the Apes (both the 1968 film and Boule's 1963 novel). Today, the film can be seen to prefigure much of the work of Hayao Miyazaki at Studio Ghibli (Princess Mononoke, Spirited Away) due to its palpable political and social concerns, cultivated imagination, and memorable animation techniques. Fantastic Planet tells the story of "Oms", human-like creatures, kept as domesticated pets by an alien race of blue giants called "Draags". The story takes place on the Draags' planet Ygam, where we follow our narrator, an Om called Terr, from infancy to adulthood. He manages to escape enslavement from a Draag learning device used to educate the savage Oms - and begins to organise an Om revolt. The imagination invested in the surreal creatures, music and sound design, and eerie landscapes, is immense and unforgettable. 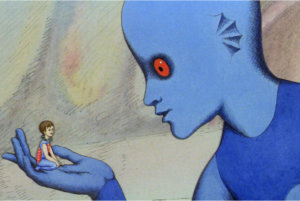 Widely regarded as an allegorical statement on the Soviet occupation of Czechoslovakia, Fantastic Planet was five years in the making at Prague's Jiri Trnka Studios. The direction of René Laloux, the incredible art of Roland Topor, and Alain Goraguer's brilliantly complementary score (much sampled by the hip-hop community) all combine to make Fantastic Planet a mind-searing experience. This animated science fiction feature was well-received on its first showings last year, and it is a pleasure to see something other than Walt Disney reaching British screens. Though shot in conjunction with the Czechs at Jiri Trnka's studio, it owes nothing stylistically to that great animator. Rather, the spirit of Lenica or Borowczyk seems more in the ascendant, with the unexpected and grotesque continually being invoked with deadpan nonchalence. Laloux made a name for himself back in 1965 with Les escargots (again in collaboration with Topor), a macabre fantasy about giant snails, and then rabbits, consuming all and sundry. Fantastic Planet is equally pessimistic, and enlightened with a quirky inconsequential humour which fits well fits well with the strange visuals. The original French title translated as Savage Planet, but although 'Fantastic' is lighter in tone it better represents the work's atmosphere. The story is simple enough: we follow the upbringing of a domestic human Om on the planet Ygam, ruled by the giant, 39 feet tall Draags. Terr, the baby Om, is adopted as a pet by Tiwa, a young female Draag, but when grown-up he escapes and finally leads a revolt by the enslaved Oms against their tyrannical masters. Shades of Gulliver hang heavy, and we are often invited to ponder on the morals of having household pets, but in general Fantastic Planet does not strain itself in a desire to lecture. Some of the imagery is stock science-fiction hardware (like the 'collar of obedience' worn by all Oms), but Laloux and Topor rarely spend much time on such matters. Their chief concern is to paint a diabolical planet, inhabited by plants, creatures and forms of amazing beauty and savagery. Crystals spring from the earth like crocuses, a huge bird burrows in the ground for humans using its circular beak like a pastry-shaper, and a hippopotamus-figure first caresses its victim with its tongue before swallowing it with scarcely a blink. Laloux's invention in this respect is a constant source of surprise and delight, and must be sampled at first hand: with such interjections he is able to sustain the story over its 70 minutes with hardly a slack moment, and the conventional 'plot' often becomes secondary in importance. Visually his style is painterly and only semi-fluid; this adds to the atmosphere and stresses the quirkiness of the whole film. The pen-and-ink drawings are often finely detailed, and when Laloux desires greater fluidity (as in a sequence of some Draags meditating and metamorphosing) he shows himself fully the equal of his technical resources. - Derek Elley, Films and Filming, January 1975. This is a strong high-definition transfer. Generally speaking, detail is very pleasing and contrast levels a lot more convincing than I expected them to be. The color-scheme is also dramatically improved - blues, yellows, greens, browns and blacks look fresh and stable. Heavy banding and artifacting are not a serious issue of concern. This being said, there are a few scenes in the film where some extremely minor color pulsations are noticeable. Occasionally, light noise is also easy to spot. Overall, however, the image quality is very strong, and I feel comfortable stating that La planete sauvage has never before looked this good. The French DTS-HD Master Audio 2.0 track is solid. Its dynamic amplitude is surprisingly good - the ambient effects and Alain Goraguer's psychedelic soundtrack sound great. The dialog is crisp, clean, stable and very easy to follow. There are no audio dropouts, pops, or cracks to report either. English subtitles are provided. - Dr. Svet Atanasov, blu-ray.com, August 3, 2010.